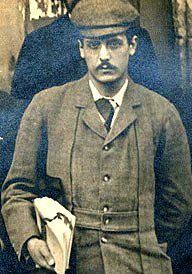 An often overlooked figure, Oxford folklorist Percy Manning was the first to take a scholarly interest in the Morris. He worked with Thomas James Carter, a retired brickmaker, using him to 'collect information on local folklore and custom'. Manning published an account of morris dancing in 1897 and equipped the declining Headington Quarry morris dancers for a performance in 1899. Had he not done so a more famous encounter on Boxing Day 1899 might never have happened. That famous encounter took place at Headington just outside Oxford on Boxing Day 1899. It was to spur a massive resurgence of morris activity throughout England. Cecil Sharp, a great pioneer of the folk music revival, was spending Christmas with his wife Constance and their children, at the home of Constance’s mother. She lived in Headington, at Sandfield Cottage which (despite its name) was quite grand house where building work had been recently done by the local firm of Knowles & Son. 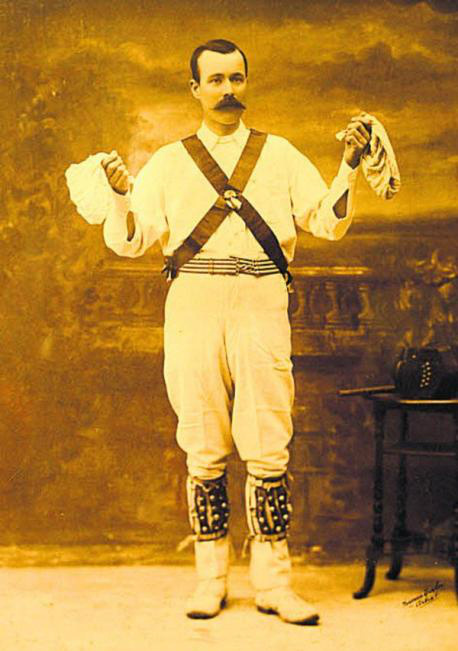 Foreman of the gang was a morris dancer and brilliant concertina-player named William 'Merry' Kimber. On Boxing Day 1899 Kimber appeared at the house with the Headington morris dancers. They were not looking to make history - only to earn some money, as bad weather had led to a shortage of building work. Sharp saw the dancers performing ‘Laudanum Bunches’ with Kimber playing the concertina, and was fascinated. He had until then been wholly unaware of the morris tradition. Sharp asked Kimber to come back the next day to play the tunes while he wrote them down. So began a long and dynamic relationship. Kimber became Sharp's informant on the Headington Quarry Morris tradition - which had a recorded history stemming from the late 18th century. And Kimber went on to partner Sharp at lectures. Sharp spoke and Kimber played the concertina, also demonstrating the dances with great vigour and artistry. A nationwide revival of the morris followed. Existing traditions were explored with passionate interest, and a number of Morris clubs came into being to support the traditional teams still dancing. In Oxfordshire, it was found that besides Headington Quarry, towns and villages such as Bampton, Abingdon and Eynsham also possessed vigorous traditions maintained from early times. 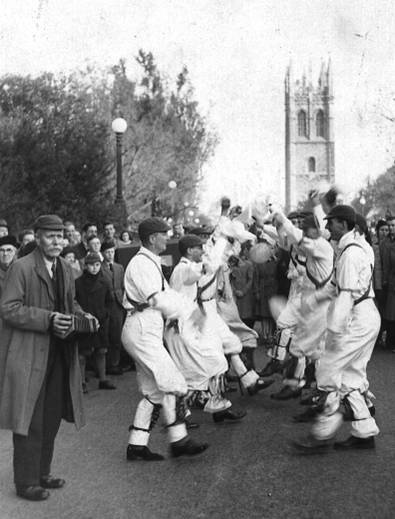 By the outset of World War One, several members of Oxford University had become keen morris dancers, inspired especially by Reginald Tiddy, a Fellow of Trinity. Tiddy himself was to die at the Somme in 1916, but his spirit lived on after the war. In 1923 enthusiasts from the Oxford colleges on May Morning under Magdalen Tower. Police were put on duty that year to see that there was no hindrance to traffic. But far from disapproving of the street display, officers were so smitten that they decided to form a morris team of their own. The Oxford City Police Morris Side danced to great acclaim from 1923 to 1936, with the great William Kimber as their tutor and musician (more on their extraordinary story anon). Already so active in the morris revival, the college enthusiasts were formally constituted as the Oxford University Men's Morris in 1926, and they flourished for several years before struggling to keep up numbers. By 1934, the side was convening to dance only on May Morning. 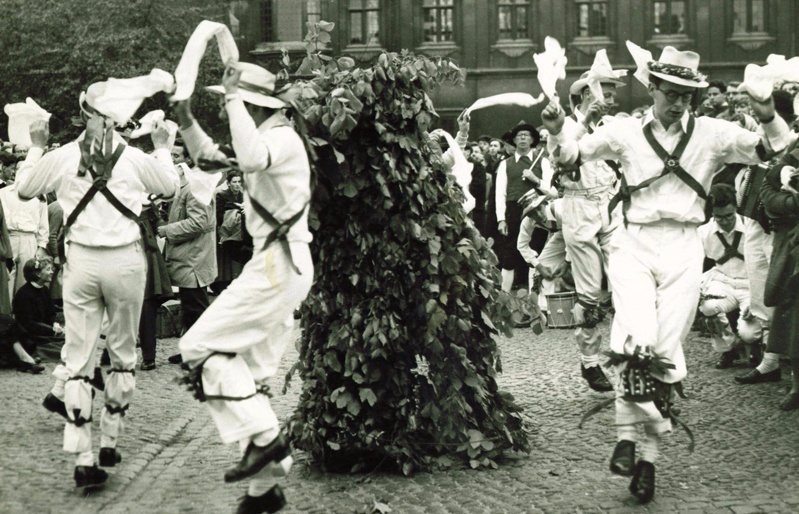 This hiatus led in 1938 to the founding of the Oxford Morris Men, drawing members from a broader pool of dancers. They have been known since 1959 as The Oxford City Morris Men to distinguish them from the University side. Both sides are now flourishing; they practise together and often perform in summer at the same displays. 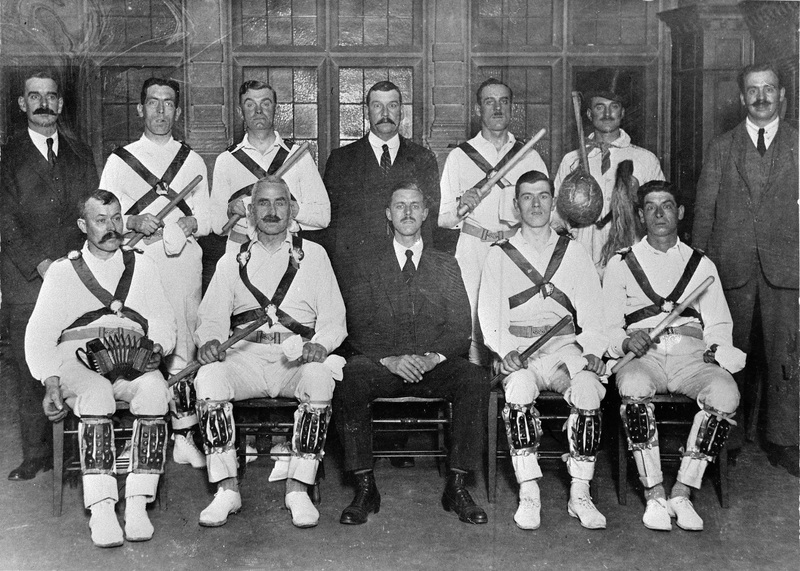 Oxford City Police Morris Side, 1926 (photo courtesy of Oxford University Images). William Kimber is seated front left, concertina in his lap. The side disbanded in 1936, following a display in which a 14-stone officer fell through a platform. William 'Merry' Kimber lived through two world wars to see morris dancing firmly re-established in Britain. Born in 1872, he died on Boxing Day 1961 at his Headington home in St Anne's Road. A bricklayer by trade he had built the house himself, dubbing it 'Merryville'. The funeral was held at Holy Trinity Church, Headington Quarry, and his coffin was carried by the Headington Quarry Morris Men in their morris regalia. In 2011, a Blue Plaque to William Kimber was unveiled at his home.